This article is about the real person. For the Futurama character, see Patric M. Verrone's head. Patric Miller Verrone is an American writer and labor leader who is a writer for Futurama. 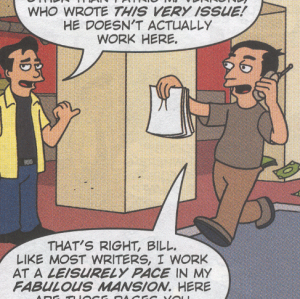 After the series went off the air, Verrone began writing various issues of Futurama Comics, published by Matt Groening's Bongo Comics Group. Many of his stories have been very unique; for example, one of his issues can be read seven different ways ("Six Characters in Search of a Story"), and another involves folding and manipulating certain pages so that the story can flow between various pages ("Bender Breaks Out"). He has also co-written Game of Drones and written a few stories for Simpsons Comics and Bart Simpson comics. Thanks to his own writing, he, along with other Bongo staff appears in "Bender Breaks Out". He also appears as his head in a jar in "Lrrreconcilable Ndndifferences". He is married to Futurama writer Maiya Williams. Writer for both the show and comics. 85 "The Simpson Family Circus"
85 "...Crap That No One Wanted"
18 "Bart Simpson: Secret Agent, Man"
18 "The Truth About Cats And Mice"
Verrone's episodes for season 6 have the same production numbers and broadcast numbers as his episodes for season 7. Verrone wrote 6ACV03 and 7ACV19. His wife wrote 6ACV05 and 7ACV21. 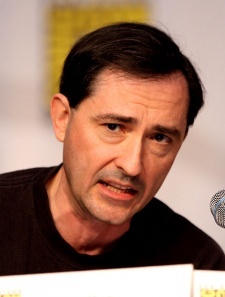 He is one of only four people to have writing credits in all seven production seasons, the others being David X. Cohen, Eric Horsted and Ken Keeler. This page was last edited on 31 January 2018, at 22:58.